How to handle Next Action conflicts? When Next Action conflict occurs? How to resolve Next Action conflict? Changing of contact ownership: When ownership of a contact is changed, the Next Action of the contact assigned to the old owner is automatically changed to the new owner. This can result the new owner / user to have duplicate Next Actions with a contact: the existing one and the re-assigned one. Removal of a user: When a user is removed from the system, the similar conflict appears as in the Changing of contact ownership scenario. Contact details submitted through online form (Wufoo): If an existing contact is submitted through an online form, the default Next Action from this submission can clash with existing Next Action for this contact. Merging of duplicate contacts: If two or three contacts are merged, the Next Action of the last added contact clashes with the other contacts existing Next Action. How to resolve a Next Action conflict? Whenever there’s a Next Action conflict, the contact appears at the top of the user’s Action Stream list with a warning yellow symbol prompting him/her make a decision. In the Action Stream, click on the contact with the yellow warning symbol (see A). 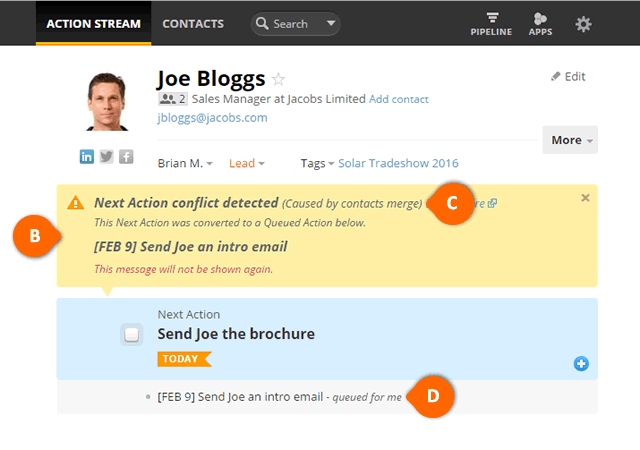 Once this contact is opened in Contact View, the yellow banner is displayed (See B) highlighting the conflicting Next Action and the reason for the conflict (See C). The conflicting Next Action is converted to Queued Action assigned to you (See D). Returning to your Action Stream will dismiss this yellow banner, leaving the conflicting Next Action as a Queued Action assigned to you.